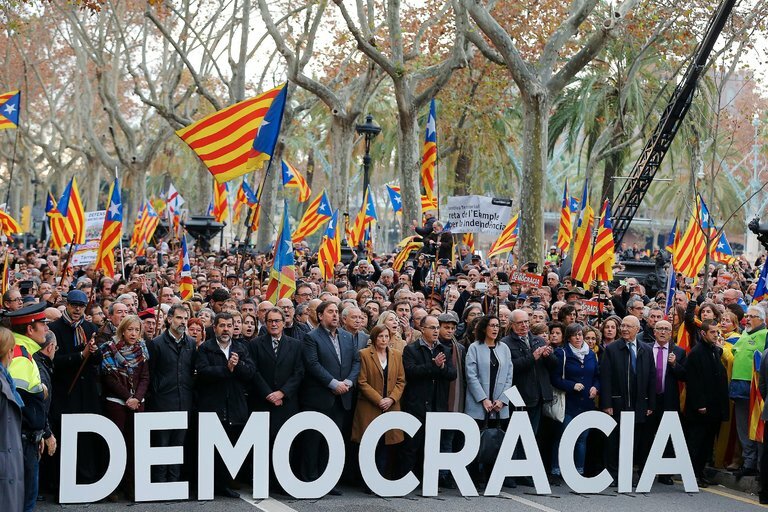 BARCELONA — Are the interests of citizens in a democratic parliament debatable? This is what is at stake in Catalonia, where parliamentary deputies demand the right to exercise their freedom of speech, while the Spanish government says they must accept being censored. Last July, the Catalonian Parliament debated a report on the road map to independence in Catalonia, and voted on it. Afterward, the state prosecutor filed a complaint that charged me with contempt of court and neglect of duty. My crime was simply to fulfill my duties as president of the Parliament in allowing a debate that had been requested by a majority in the chamber. This is just one more example of the Spanish government’s strategy of using judicial measures to interfere in the political affairs of Catalonia. And because this government is unable to resolve political challenges through politics, it is using a politicized court system to silence dissent and democratic debate. What is happening in Catalonia is a judicial assault by Spain on Catalonian democracy and freedom of speech, an assault that violates the principle of the separation of powers that is the foundation of the rule of law in this country. Catalan elected officials who favor independence are now the target. More than 400 town and city councilors, and mayors, have been charged with offenses because of their legitimate advocacy for independence. The previous president and other members of the Catalonian government are to be put on trial merely for organizing a public consultation in 2014 on independence in which more than 2.3 million Catalans participated. Their crime was setting up polling stations so that citizens could express their democratic views. Aware of the negative publicity its measures have received abroad, the Spanish government has tried to improve its image by rolling out a program called “Operation Dialogue.” This cosmetic initiative, devoid of content, is discredited with every new charge or arrest. Spain’s turn toward judicial authoritarianism continues unchecked. When the pro-independence Scottish National Party won the 2011 parliamentary elections and formed a government in Scotland, Britain’s prime minister at the time, David Cameron, understood the magnitude of the challenge — and solved it through politics. He agreed with the government of Scotland that it would hold a referendum on independence. The independence movement lost this referendum, in 2014, by 45 percent to 55 percent, but democracy was the winner. As is true of Scottish nationalism, Catalan politics and society have a profoundly pro-European character — very different from the Euroskeptic movements that have championed Brexit and from the demands of the far-right populists who are increasingly making their mark on the European Union. Britain’s approach toward Scottish independence also contrasts sharply with the Spanish government’s toward Catalonia. Although the independence movement won 48 percent of the vote and an absolute majority in Parliament in Catalonia’s 2015 elections, the Spanish government has shunned negotiation. Instead, it has bet all its chips on repression. The Spanish government’s restrictive interpretation of the Constitution, which ought to be the guarantor of citizens’ rights and freedoms, has turned it into a shield against dialogue. Catalonia’s Parliament is a pluralistic assembly that reflects the diversity of Catalan society and permits the expression of all voices and opinions. There, those in favor of independence and those against it — both legitimate options — can debate and vote freely. That is why Catalonia will draw a line in the sand in defense of its parliamentary freedom. The solution to the situation is not to suppress debate, but to allow democratic, free and informed citizens to be heard. A recent poll showed that more than 80 percent of Catalans favor deciding their future through a referendum. This is, therefore, a majority demand that Catalonian institutions plan to carry out in September, even though the Spanish government has stonewalled and obstructed all efforts by Catalonia to reach an agreement on holding a vote. In December, before an examining magistrate, I argued that no court has the right to prevent talk of independence in the Parliament of Catalonia, any more than it could suppress discussion of any other subject of interest to citizens. We will not open our doors to censorship. We are committed to preserving the right of free expression for all deputies, no matter what they think and how they vote. This is the foundation of democracy and freedom, attained at such a high price in all democratic societies. “Liberty, when it begins to take root, is a plant of rapid growth,” George Washington wrote. True enough, but the fight for civil rights and liberties must be constant and unwavering, for history has shown how easy it is to lose them. Carme Forcadell is the president of the Parliament of Catalonia. This essay was translated by Sonia Berah from the Spanish.